And again, excuse the massive picspam, but I couldn't stop photographing all of this! Announcing my latest OOAK outfit for Evangeline Ghastly. The colour palette is based on Monet's Water Lilies - perhaps not the most original inspiration, but still. There's a reason those paintings are loved the world over. The way I like to start, is to gather all my matching bits and pieces together. then I make a shell garment out of cotton lawn, over which I'll 'build' the art piece. I found these fabulous scarves on Ebay, and bought one, as it matched my scheme perfectly. It gave me something use while I picked out my embroidery threads. First I pinned it to the skirt while I figured out how I was going to make this thang. Using different shades of really lovely soft tulle, which I had to buy from overseas, I worked out a way to attach the panels to the lining. The panels are not sewn down the sides, but are so full and frothy, they overlap and create new shades. I pinned all my fabrics to the doll, and left her overnight (I do feel sorry for her, having her arms in the air for so long.) It's good to wake up and the first ting I see is my idea. It helps me to mull it over and work out the practical methods I'm going to use to sew it all together. I love this with a passion. So much so, I'm going to make a gown similar, for Ellowyne. Or Maybe Deja Vu. DV has a lovely body to sew for, very feminine. The underskirt here is still way too long for my Lilith, so she's standing on a box. The bodice was a challenge. It had to fit, and look gorgeous. The hand embroidery is detached chain stitch (lazy daisy stitch) and french knots. It took me four solid days to embroider the bodice and the armlets. Oh my! Once that was done, I assembled the dress. It took a very gentle touch to make sure the mesh over the top of the skirt went on nicely. I could never have done this with a machine, they're just too brutal. The basic dress looked lovely, but I had lots more work to do. I was dreading the shawl shoulder part. I knew what I wanted, but wasn't sure how to make it happen. I had a good day that day, it went exactly right first time. I know, it's not a cheap item at all, but the hours and hours of work, and pulling together all the right materials all adds up. With the shoes and the lavish accessories, It's a very special piece and I wouldn't be able to repeat it if I tried. Had me a blast making the choker and the fascinator. And yes, those little flowers and leaves are all hand crocheted. The armlets are lovely too. I think they really add to any outfit. To make it easier to dress the doll, the shawl 'collar' (what do you even call it?) fastens and unfastens at the back, with snaps. Some of you will have seen the shoes before. They worked perfectly, one of my real first-time successes. The veil is easy to roll up, or tuck under, if you don't want your girl's lovely eyes too hidden. This looks so good on my "Dreamstate" Evangeline. So that's it. Next, I have an idea for a new Kaye Wiggs sewing pattern. It'll be something little-girly and charming, and based on one of my Patience patterns. I hope folks will love it. I will get around to making a corset for KW girls, but I keep getting daunted because of the MSD body bulge. It's on the list though. Wow... you've done it again - just gorgeous! 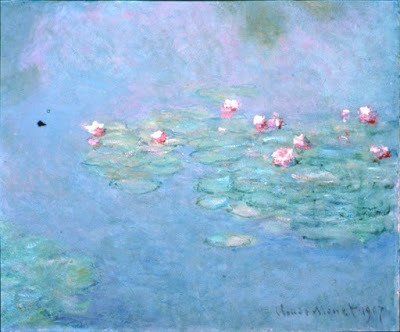 What's not to love about Monet's Waterlillies and you've captured the colours beautifully? Love the scarf you've used on the skirt and the embroidery on the bodice is a thing of beauty - I'm not surprised it took 4 days!. That's a fab idea of having snaps on the back to fasten the shawl collar (I've no idea what it's called either)... when I made a dress with a similar neckline I tied it at the back and pinned it... a snap would have been much easier really!! The feathers on that fascinator are just lovely... finishes it off a treat!! I'll shut up now... Gold star for Tess!! :) I've always loved Monet, and the colours are just delicious. My fingers got really sore with the embroidery, but at least I didn't puncture myself! Yes, I've never known what those shoulder sash things are called. I often find it hard to get the doll's arms into those, while pulling on the dress, so I made it nice and easy. I will wear my gold star with pride, lol! The outfit sold really quickly too. Isn't it weird that I made a load of smaller £25 to £35 outfits but it's the really expensive ones that are selling. That's the weird thing with the dolly world, almost impossible to figure out any real market research. I think people really like the one-off one of a kind outfits that no one else is going to have and are therefore prepared to pay more to get them. I also don't think people realise how long it can take to make a knit or crochet outfit - but if you compare to a sewn outfit I suspect the perception is that a sewn outfit is much more complicated and time consuming and therefore worth paying more for. All your outfits are lovely whatever the price!